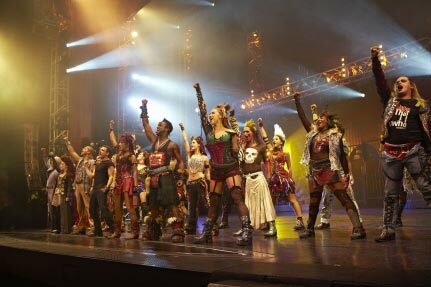 In 2002, the hit stage musical We Will Rock You, based on the songs of Queen, created by Queen guitarist Brian May and drummer Roger Taylor together with British comedian Ben Elton opened. The show was originally due to close in October 2006 before embarking on a UK tour, but due to unbelievable popular demand has been extended indefinitely. The show is the longest running musical ever to play at the Dominion Theatre. But resistance to the company is growing and gaining momentum. Underneath the gleaming cities, down in the lower depths of Planet Mall live the Bohemians. Rebels who believe that there was once a Golden Age when the kids formed their own bands and wrote their own songs. A time, called The Rhapsody. Legend persists that instruments still exist somewhere on Planet Mall. Somewhere, the mighty axe of a great and hairy guitar rock god lies buried deep in rock. The Bohemians need a hero to find this axe and draw it from stone. Could it be the one who calls himself Galileo is that man? But the Ga Ga Cops are also looking for Galileo and if they get him first they will surely drag him before the brutal Killer Queen and consign him to Oblivion across the Seven Seas of Rhye. Who is Galileo? Where is the Hairy One's lost axe? Where is the place of living rock? Please visit our show page for special offers, reviews, venue information and dinner and show packages. Avoid disapointment and book your We Will Rock You Tickets securely online now!